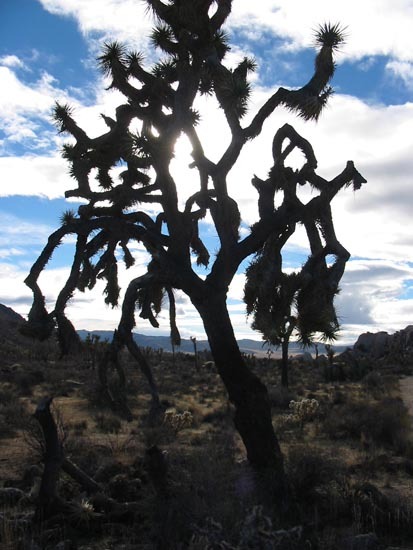 The plants – tough survivors, to say the least.There are two kinds of Joshua Trees, one grows tall before it branches out… the other branches out more quickly, gets fatter, faster. 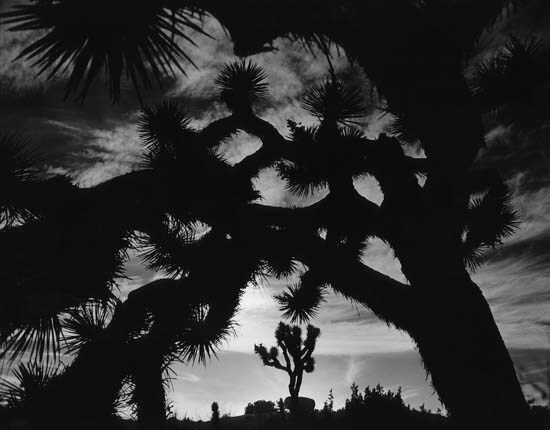 According to wikipedia, and what i have heard/read, The name ‘Joshua Tree’ was given by a group of Mormon settlers who crossed the Mojave Desert in the mid-19th century. The tree’s unique shape reminded them of a Biblical story in which Joshua reaches his hands up to the sky in prayer. Whatever grows in an enviroment like this is obviously pretty hardy. But don’t let that allow you to understand that any damage inflicted (especially by humans ) takes a long, long time to be repaired. These plants can stand extremes of weather, but they grow very slowly, and should be treated with all due respect. 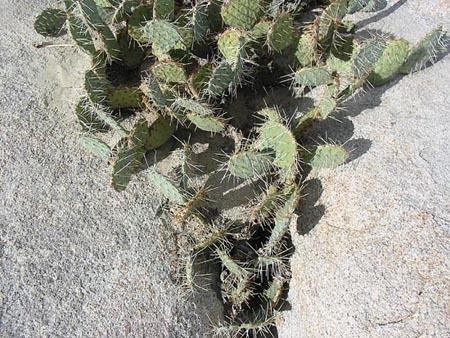 I have seen pictures of suguaro cactus full of bullet holes. It’s not very challenging to hit a target that hasn’t moved in decades, but some assholes do it anyway. 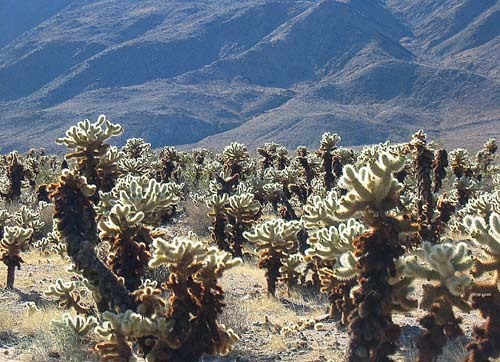 If anyone thinks the desert is desolate, and they can do what they want, regardless, they are stupid and heartless. As you can see below, some of them are NOT doing so well. 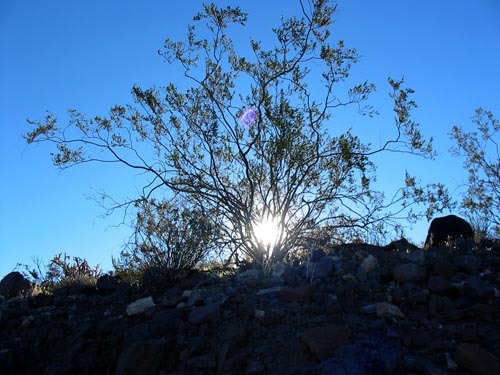 The creosote bush is a wild, crazy, spindly thing, it’s wonderful to watch it sway in the wind. It also provides shelter and food (seeds) to small mammals. 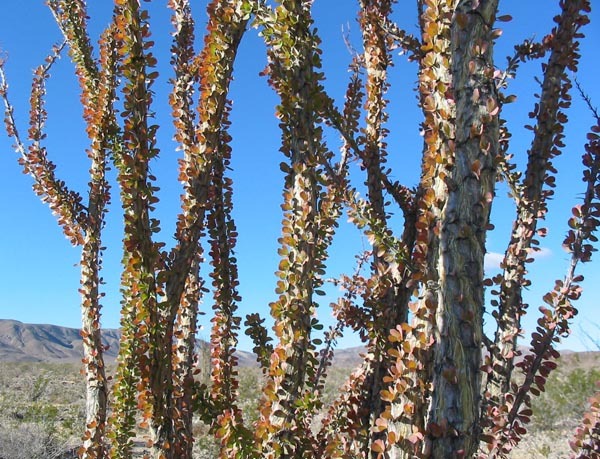 It has also been valued by desert peoples – It has been used to treat at least 14 illnesses. Twigs and leaves may be boiled as tea, steamed, pounded into a powder, pressed into a poultice, or heated into an infusion. Everything here has multiple uses for many creatures. Nothing goes to waste. It’s a perfectly balanced ecosystem. This image shows just how much everything here takes advantage of any niche it can, no matter how small. Some incredibly small amount of rain finds it’s way to this glorified crack in the rocks -lo and behold, life blooms. How much can you do, with very little? Can you..uh..improvise? The fact that this plant is here begs this question. 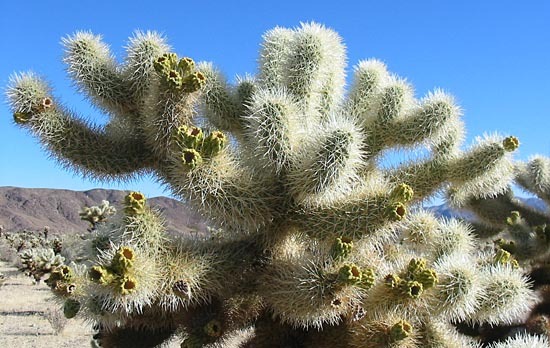 The Cholla cactus is one of my favorites. I love these totally untouchable rascals. They are so visually appealing, but resist the urge to touch, you’ll be glad you did. This one is so tough, but so tender. Look at the stalks, they are tough. And the leaves that grow from them? Sooo tender. Just be happy that there are things on this planet that are both, at the same time. And that you get to see (=experience) both. In another one of my blogs, i have a thing called ‘the whatever catches my eye’ file. 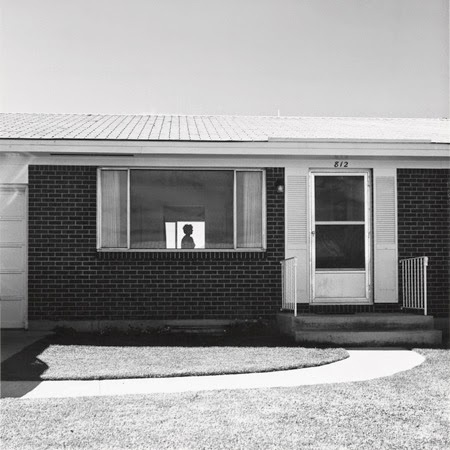 A retrospective of Robert Adams photography. This is a really haunting image. At Cedar Mesa in Utah, the presence of the Ancient Ones is everywhere — in the abandoned villages, kivas and cliff dwellings. Relics are also everywhere — to be admired, but don’t touch or take. Next month, More Joshua Tree, landscapes… and then maybe some skies…and then it will be time to move on… to I’m not sure where.